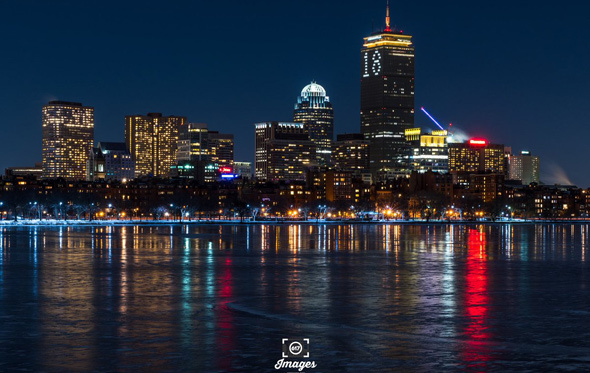 617 Images shows us the Prudential building on New Year's Eve. 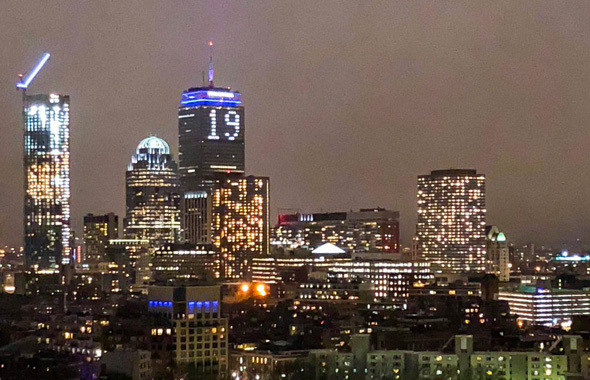 First Night organizers have called off the 7 p.m. fireworks over the Common, and the 6 p.m. parade that was to precede them because it'll be just too damn cold. The midnight fireworks over Boston Harbor, however, are still on, because presumably the totally sober adults who would watch them outside will be smart enough to dress appropriately. NorthEndWaterfront.com reports discussions among waterfront interests about bringing back New Year's Eve fireworks over the harbor if the organizers of First Night have concluded they can't or won't do them. David Parsons took in the 7 p.m. fireworks over Boston Common last night. 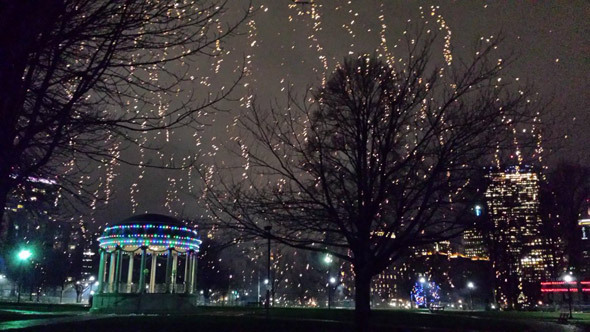 Leslee watched the light show on Trinity Church in Copley Square: Read more. 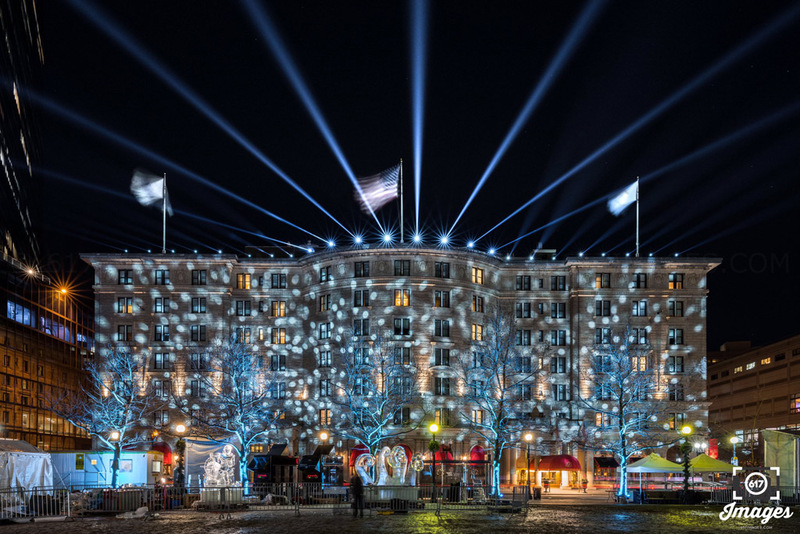 617Images shows us the Fairmont Copley Plaza last night while they were testing their New Year's Eve display. New Year's fireworks over Copley Square: Lack of money or delusions of grandeur? Watch this year as the TV hosts interview the Copley attendees and count the suburbanites that will have come in to Copley, all decked out in a spectacularly crowded space. The Back Bay event will be instantly labeled a “success” because it will look good on television. Craig Caplan watched the early fireworks over the Common tonight. 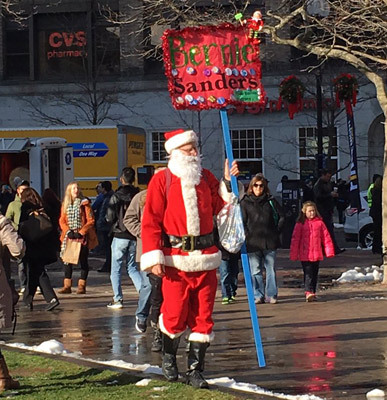 Melissa Sullivan captured this Sanders supporter in Copley Square today. The City of Boston Credit Union will underwrite fireworks over the harbor as 2016 begins, the mayor's office announced today. The credit union will kick in $30,000 towards the pyrotechnics, good news since the company now running First Night said last week it didn't have any money for them. The Herald reports Mayor Walsh doesn't want to let go of harbor fireworks without a fight, after hearing they might not go on due to the cost. There was a meeting today and the following decisions were made. The financial picture of First Night is quite reduced, and some events are not going to take place. The Grand Procession is at Copley Square, not on Boylston Street. There are not going to be midnight fireworks. There will be 7:00 pm fireworks. The Fitness walk will be a Fitness Jamboree activity on Copley Square. The Boston Courant reports (note: Link will take you to a photo of the Courant story, since the Courant is one of the few papers left in the US that does not have a Web site - on purpose, no less). UPDATE: Conventures, which is running First Night, says there will be the traditional fireworks over Boston Harbor. 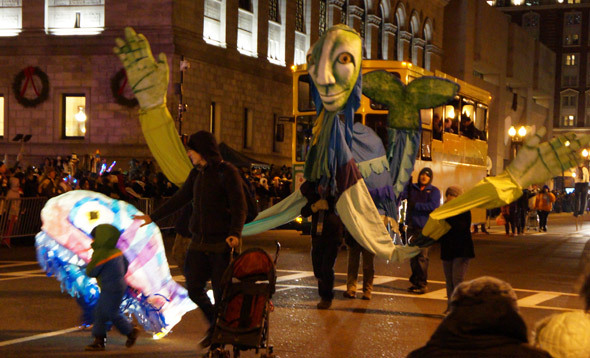 A little cold weather didn't deter First Nighters from enjoying the traditional parade down Boylston Street tonight. What would a parade be without dragons? Louise Miller took in the ice sculptures in Copley Square this morning. First Night Against Police Violence die in planned for 5 p.m. in Copley Square. Brian D'Amico ambled around the Back Bay and the Common during First Night tonight. Leslee watched a First Night ice sculptor at work at the Prudential Center last night. In 1928, at the height of Prohibition, Leslie Jones photographed the Boston Police Liquor Squad (commanded by Oliver Garrett, second from right) just before they fanned out across the city to ensure no drinking was going on at local hotels. If you're going out tonight, there's First Night, of course. The Boston Calendar has more options.